Arizona National Guard Chief Master Sgt. 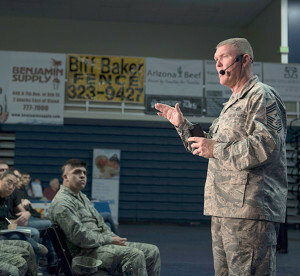 Shane Clark speaks to Guard Airmen about what it means to be an Airman at the 7th annual My Air Guard Incentive Career, or MAGIC event at Pima Community College West Campus. The two-day event included presentations on career development, continuing education, mentorship, resiliency, physical and mental health, life insurance and financial guidance. 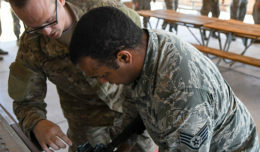 The MAGIC event is an opportunity for new enlistees and re-enlistees within the 162nd Wing to obtain information on the many career benefits the ANG can provide. The two-day event included presentations on career development, continuing education, mentorship, resiliency, physical and mental health, life insurance and financial guidance. Airmen were also given the opportunity to meet with the various subject experts to discuss their goals and come up with a plan to achieve them. Originally a service retention tool, MAGIC has become a way to not only retain Guard Airmen, but provide essential career information to new recruits. “MAGIC weekend offers financial advice that was not previously available to me in high school,” said Airman 1st Class Jason Ayala, 162nd Wing Student Flight member. Airman 1st Class Alicea Owen, also with the 162nd Wing Student Flight, said she learned about life insurance benefits and what they entail. Something she had no knowledge of prior to the event. “MAGIC weekend gives new recruits useful career information they would not typically receive prior to leaving for basic military training, so they already have a familiarity with the benefits earned for themselves and family,” said 162nd Wing Unit Career Advisor, Staff Sgt. Bryan Nixon. Not only do the attendees learn from the experts, but the program also supports a mentorship setting. During breaks, new recruits are given the opportunity to visit with re-enlisting members also in attendance. This gives them a chance to speak with them about their past experiences with the different programs. “MAGIC serves as a great mentoring environment among the audience. 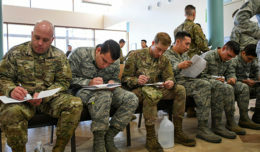 Re-enlistees serve as effective leaders at this event by helping or answering any questions new enlistees may have,” said 162nd Wing Recruiter, Staff Sgt. Eddie Jones. 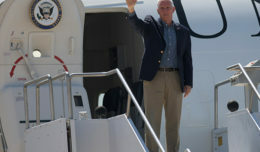 MAGIC has been an influential model to other organizations in the United States. Four other states are also finding the MAGIC event model to be a significant tool in providing Guard Airmen with important knowledge, said Chief Master Sgt. Shane Clark, Arizona National Guard senior enlisted adviser.